Built with a lightweight technology tha allows flex and control and scooprockerline accuracy. 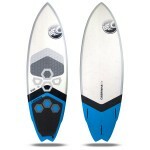 The board is built with a CNC EPS core of 20 kgs/m3 density, then laminated with 200 grms biaxial glass fibers and finished with a 55 grams carbon net over a bamboo stepping deck vacuum glued onto the board at 90° compared to the stringer length so as to avoid excessive stiffness onto the board flex. The stringer of the board is made with an omega glass stringer that saves up 10% of the board total weight compared to a classic wood stringer. Slight tail lift on a very straight rocker with kicked nose on a constant scoopline, makes the perfect balance when wanting to mix freestyle with surfing.